The image of orange Vicini bike in Berlin captured with the Canon 50mm f/1.8 on a walk in Berlin Mitte. Around every corner in Berlin you will find new adventures and new scenes to shot with your camera. There is so much graffiti mixed with new and old – it now wonder why it’s one of my favorite places to visit. Around the corner of a new building you will find an old building still bearing mark from the war. It’s like hidden pockets of history in a world on new and development. 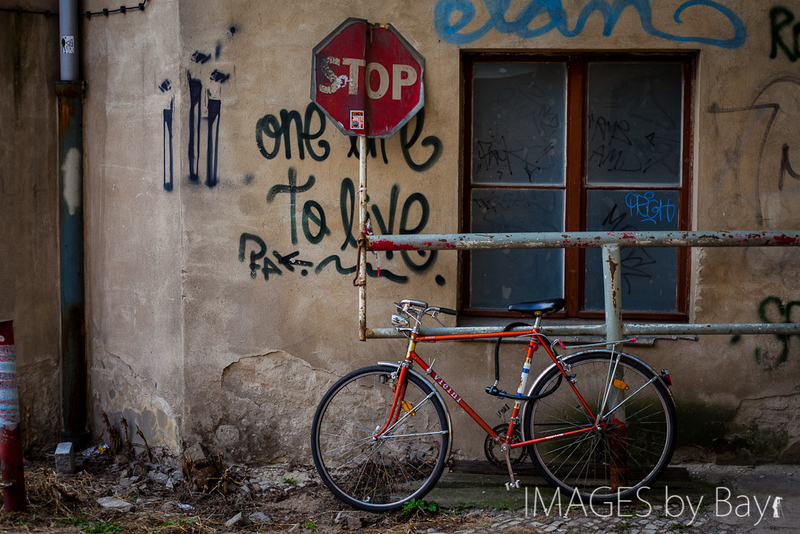 In this image I noticed the graffiti “One life to Live” with a large stop sign – a reminder that we should hold the breath, mute and pause life a second to fell how we are living. Is it the life we want to live or not – we only have one! Edinburgh Taxi – We are back in Edinburgh!